I always think of Christmas when I think of fudge. Maybe one Christmas, my mom made several types of fudge, and now that’s embedded in my mind as the “season” for fudge. But, who am I kidding? Every season is the season for fudge! Melt butter. Add sugar, then other ingredients. Boil about 5 min to soft ball. Let cool 2 hrs. But this is such a beautiful site. Love the idea and the design. Actually I think this one was from Aunt MARNIE. 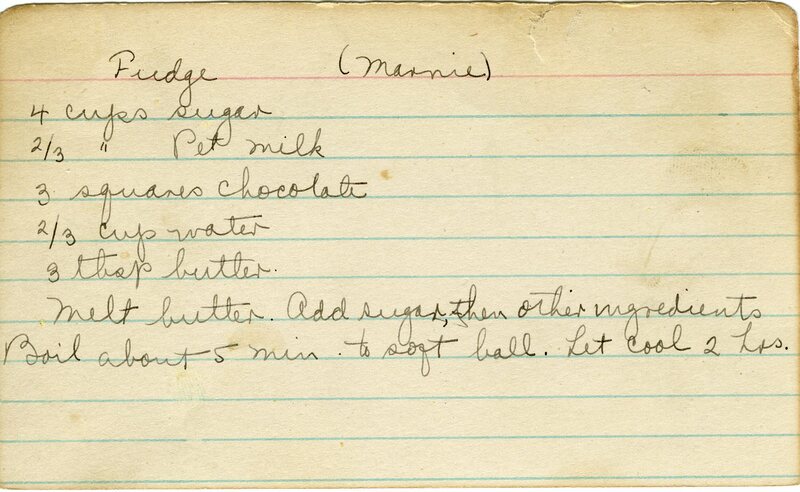 During WWII when sugar was rationed Gram made desserts – of course what else! But Aunt Marnie used her ration of sugar on candy, which her family really preferred to dessert. This is why I think it was from Aunt Marnie – in Gram’s handwriting it is difficult to tell.